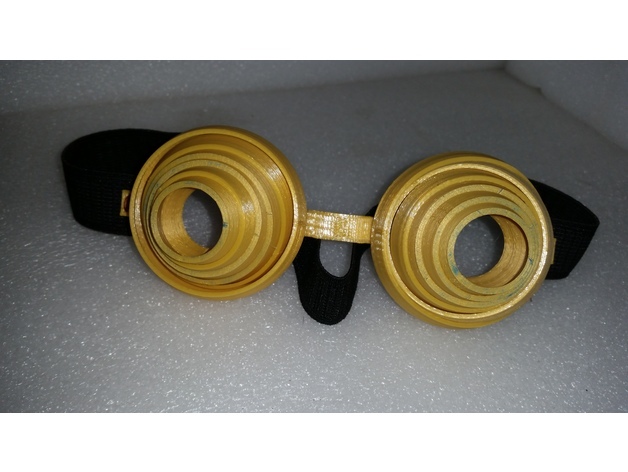 Chameleon Eye Shades #3DPrinting #3DThursday « Adafruit Industries – Makers, hackers, artists, designers and engineers! onebeartoe shared this project on Thingiverse! These shades are inspired by the chameleon’s eyes. They sorta work, and are fun to wear. There are sew tabs on each end of the model. An eleastic strap was sewn to the printed model in the pictures for fastening to a head. Postprint, apply some E6000 or similar adhesive to the inner nose bridge area to avoid the edges touching skin. What ever nose buffer is used make sure to let it dry before letting it touch a person’s skin. What a lovely day for chameleon eyes!